GM Tech-2 is the same tester as GM Technicians used to diagnose GM vehicles. The Vetronix Tech 2 comes with Authentic GM software and provides support for on-board diagnostics on all GM systems from 1992 to 2011. 1.Authentic GM software in the Tech 2 Flash means the most comprehensive diagnostic software available for late model GM vehicles. 2. Support for on-board diagnostics on all GM systems 1992 thru current year. 3. Removable hardware modules provide insurance against scan tool obsolescence. 4. Large, easy-to-read backlit screen. 5. RS232 & RS485 ports provide the avenue to connect future devices to your Tech 2 Flash. 6. Ability to capture stored DTCs, Freeze Frame, and Failure Record for later review. 7. Ability to view the status of vehicle diagnostic tests as they run. 8. Bi-directional the authentic GM 1992-current year software will provide full bi-directional control when performing power train, chassis, and body diagnostics. 12.Memory: 32 MB flash type II PCMCIA. Type III slot available for future expansion. 13. Communications: Integral RS232 communication port. An industry change in protocol from OBD II to Controller Area Network (CAN) has begun. 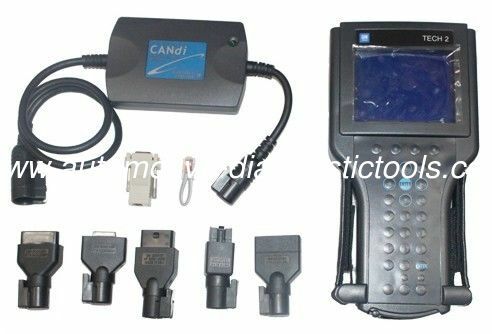 In order to perform diagnostics on a vehicle that uses the CAN interface; you will need the Tech 2 Flash and a CAN diagnostic interface module. The module connects between the Tech 2 Flashes diagnostic link cable and the OBD adapter. Once the module is connected, it can be used on all GM vehicle applications, even those vehicles using other platforms such as OBD I and OBD II. when you place order, please tell me which software you need. Each card just can be put on one car software.